relax | Sound Body Solutions, Inc.
Here’s a great article from the American Massage Therapy Association that can help you realize the benefits massage can bring into your life, particularly as an aid for reducing stress. Have a read, and let me know your thoughts! Do you put off getting a massage? Have a fun and healthy weekend! When Did It Become Cool To Be Busy? Are you too busy? Too busy to relax? To sleep? To take care of yourself? I loved this article from MindBodyGreen, and think you will, too! When Did It Become Cool To Be Busy?. how you’re going to take care of yourself this weekend? In between all the things you simply must get done over the long weekend, remember to schedule some time to really enjoy and care for you! That list you have … you know, the one that has all the stuff you want to do but never get around to doing because you’re so busy? I urge you to pick one – just one little thing – and spend some time on that this weekend. And smile while you’re at it! There’s something about Sunday mornings that just makes me happy. A little more time to enjoy a meal with the family, an extra large mug of coffee, and the feeling that I can relax all day … even if that’s not true! How do you enjoy your Sundays? Sleeping in, enjoying your hobbies, giving yourself some quiet time, exploring the outdoors or the town … or maybe getting a massage? Whatever you’re up to today, make it a great day! Sorting out stroking sensations: Biologists find individual neurons in the skin that react to massage. How does your body react to massage? Whether you’re a regular client or someone just looking to try something new to increase their health and wellness, there are so many things we’re learning about massage that you’re likely to find a good reason to schedule regular sessions! Follow the link to learn more! Have a busy Saturday today! I got my workout in (and hope you did, too! ), have some massage work to do this afternoon, and finally some major studying for exams. 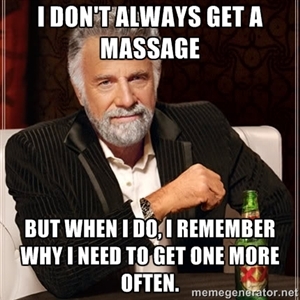 Did you schedule a massage into your weekend plans? Why or why not? I can’t imagine a better way to spend my weekend than relieving some tension, and relaxing my body and mind. Can you?